Christmas is here and my oven is put to maximum use this festive month. I have started my Christmas baking and am enjoying preparing festive treats for family and friends. The perfect time to pamper yourself and your loved ones. 🙂 Well, its been a while since I prepared a rich chocolate cake and I have been craving for one. A perfect occasion presented itself over the weekend when we had guests over for dinner. 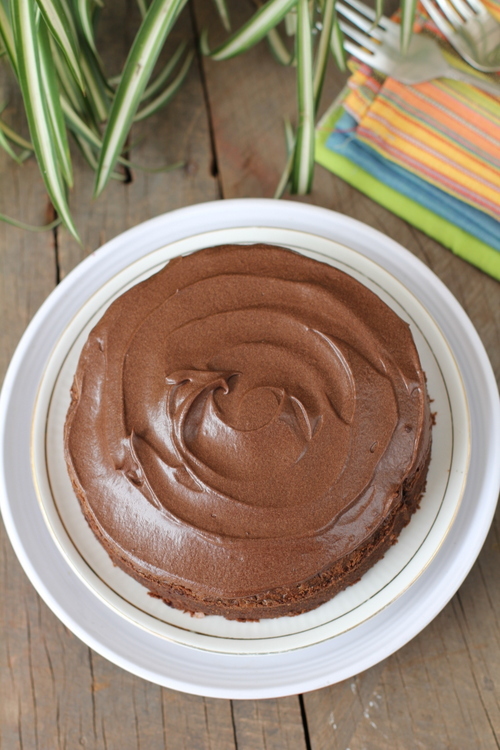 I prepared a decadent easy dessert recipe, Chocolate Mud Cake with Chocolate frosting. The mud cake turned out moist, dense and rich which my family and guests absolutely LOVED. 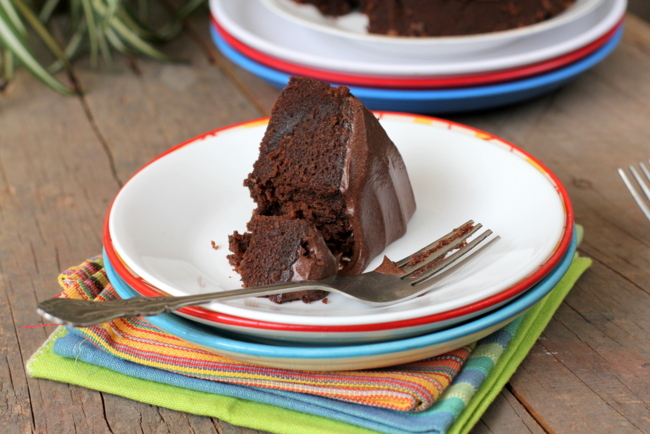 I loved the addition of coffee which added a depth of flavor to the chocolate mud cake. I used chocolate frosting to adorn the cake but it tastes good on its own too. By Sailu Published: December 5, 2012 With the Christmas season here, I have an easy dessert recipe, Chocolate Mud Cake for you. 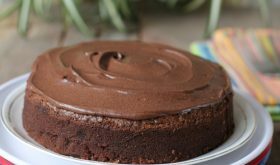 Easy to make chocolate cake that kids will enjoy. Yes, it can be made eggless. Use 1 1/2 tsp baking powder, 1/2 cup yogurt/curd and omit the eggs. Instead of 2 tbsps oil, use 4 tbsps vegetable oil. I haven’t tried an eggless mud cake. Try and give me your feedback. the butter i find in stores has salt. where can i buy unsalted butter? i faced this when baking cookies too. can venna be used? can this cake be made using pressure cooker? You can try cooking it a pressure cooker. Do leave your feedback if you have tried it in a pressure cooker. What do you mean by buttermilk exactly? Beat 3 tbsps of thick curd/yogurt. Add a cup of water and blend well. This is buttermilk. If you do not have buttermilk on hand, you can substitute with milk which has vinegar added to it. Add a tbsp of vinegar in a cup and fill it with milk. Keep aside for 5 mts and it will curdle. This can be used as a substitute for buttermilk. Thanks for your answer… I am also a bit confused about Step 8 where you have asked to divide the cake batter equally into the three prepared pans. Why are we using three pans? The cake batter makes for a very large cake. Hence I have asked to make it in smaller cake pans by dividing the batter among the pans. You can halve the recipe and make in two pans or a very large pan. Hi sailu could you please tell me from where do you get this Morde brand chocolate. In case if we dont find that what can be the substitute for it ? You can get it in any large departmental store. I am not sure where you are based, You can use Callebaut or Selbourne. Both are good. 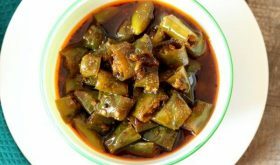 I had been following your recipes and blog for many days. I should tell you, each and every recipe I had tried so far come out so perfect. Today I tried this chocolate mud cake. But I had replaced with whole wheat flour, butter with oil and I used 1 cup of jaggery + 1 cup of sugar. Except for these replacements, I used everything as written here. It came out perfect. Thanks for sharing these wonderful recipes and inspiring many of us to cook :). I have never baked in a MW. Can you tell me the difference between caster sugar and powdered sugar? As far as I know both are made from regular sugar, except that the former is less fine the latter. Castor sugar is very fine granulated sugar. can we grind the ordinary sugar and use it?? Should we grind it into superfine?? I used cocoa powder instead of dark chocolate and it turned out little bitter. What can I do to make it alright? Anything other than icing or frosting? Yes, you can bake each pan separately. Place the other two cake pans in the fridge while the first pan is baking in the oven. Why have you divided batter into three pans?? Do we combine the three layers together?? Since the batter quantity is more, you will have to bake in TWO 9″ round pans OR THREE 6″ round pans. You will have 3 cakes. 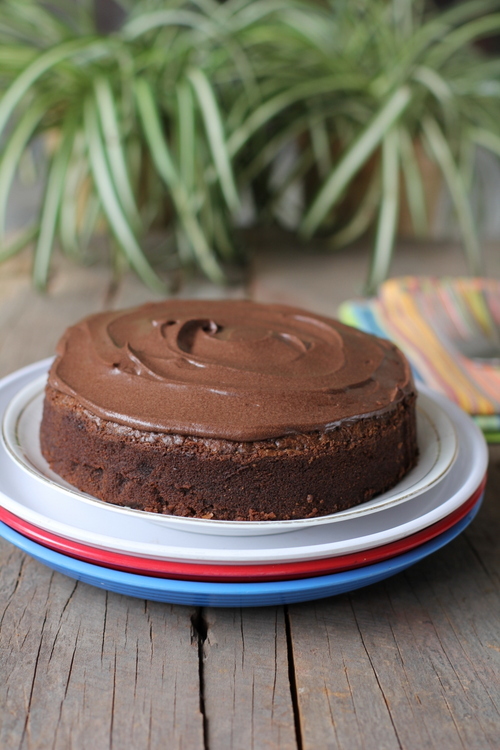 For a smaller cake, halve the ingredients and make one large cake in a 9″ round cake pan. Hi..what is the baking temperature for this recipe? ?